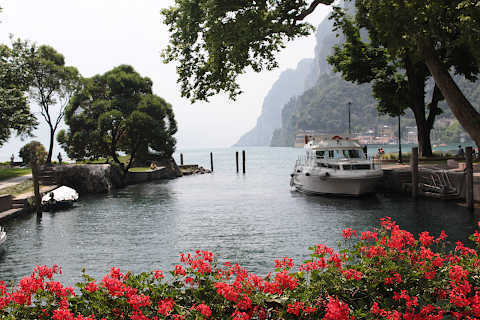 Riva del Garda is situated at the northern end of Lake Garda in northern Italy. 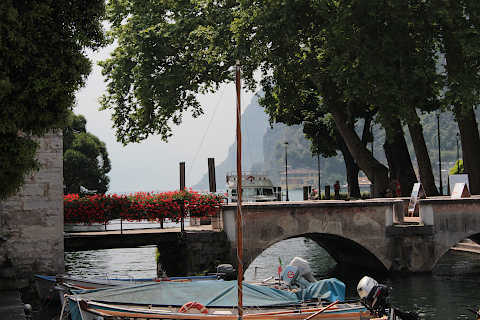 The town is among the highlights of a visit to the lake, with a fortress dominating the lakefront area and an interesting old town to explore of narrow cobbled streets and pretty shady squares. 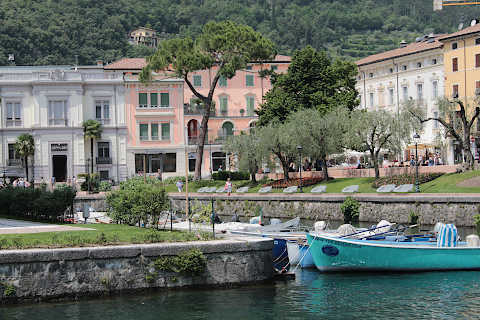 Because of the quality of its climate and some first-rate sanatoriums Riva del Garda has been visited by many literary personalities including Goethe, Nietzsche, Mann, Kafka and others. 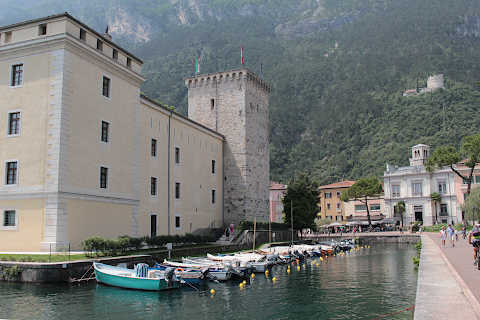 Your visit to Riva del Garda can start from the 'Rocca', a fortress on the waterfront that is surrounded by a moat, now used by small boats. This fortress was founded by the Scaligeri lords from Verona in the 14th century then restructured by the Venetians in the 15th century and also later by the Lords from Trento. The structure of the fort, with a quadrangular plan, angular towers and courtyards is similar to the other Rocca founded by the Scaligeri family in the 13th century at Sirmione. 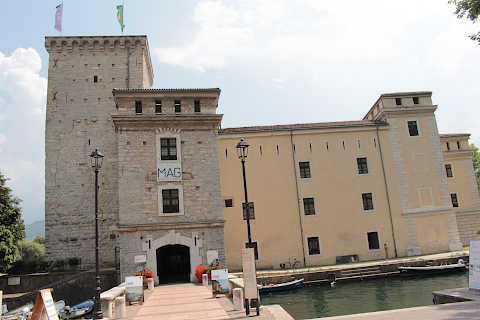 The fortress is entered by the original drawbridge and is now home to the impressive collections of the Civic Library and the Civic Museum. 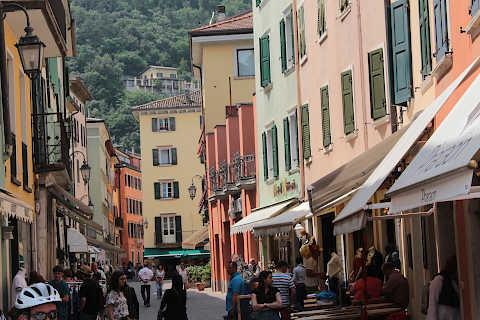 From here you can take a stroll around the port area of Riva del Garda, a lovely place for a promenade, and enjoy a coffee and an ice-cream. As well as the pastel coloured houses overlooking the lake you can also see the ruins of the fortifications that were erected in the Middle Ages to defend the port. A visit to the Apponale Tower, the 13th century clocktower in the centre of the harbour area, is also interesting with the view from the top of the tower the main attraction, and only about 160 steps to reach it!. 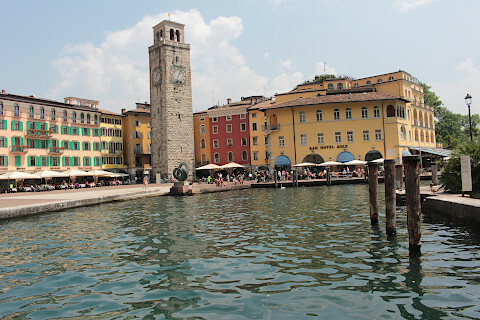 In front of the harbour is the area where boat trips depart to explore other resorts around Lake Garda. 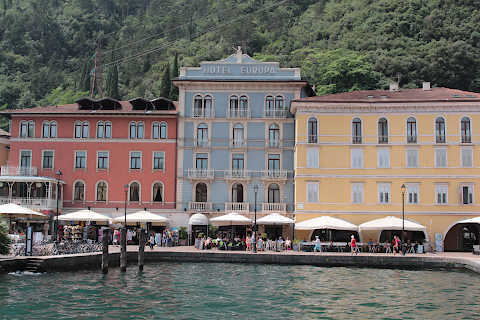 You should make sure you see the two palaces in Riva del Garda that were inspired by Venetian architecture: the Palazzo Pretorio and the Palazzo Vecchio. 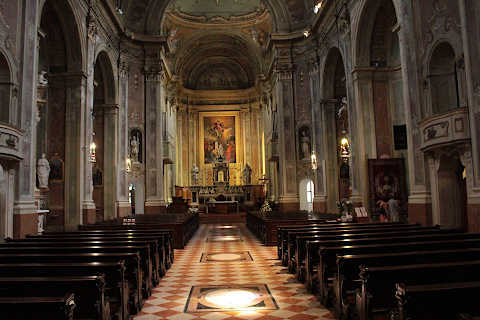 Continuing on from here you arrive in the Piazza San Rocco which has many monuments and palaces of both medieval and contemporary style due to the restructuring of the town centre during the last century. 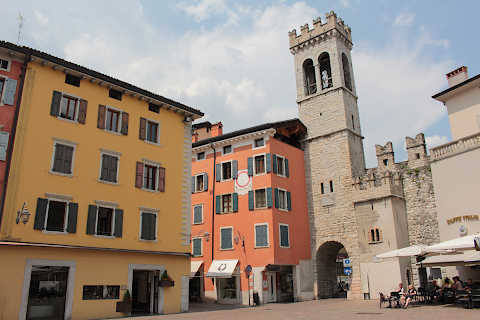 You can now explore the the Città Vecchia (Old Town), the historical centre of Riva del Garda where you can see some interesting baroque style palaces. 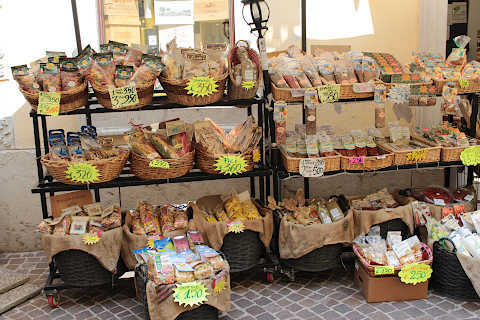 Enter the old town by the "Porta-Torre of San Marco" or the "Porta-Torre of San Michele". 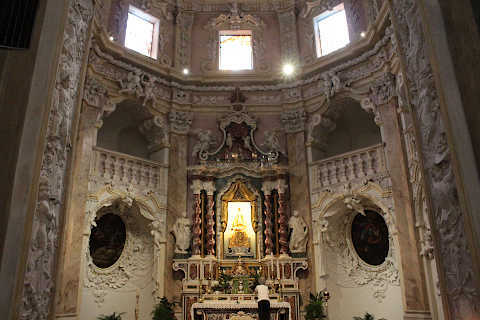 There is a baroque style church in this part of Riva del Garda called the Church of Santa Maria Assunta that has a typical baroque interior. 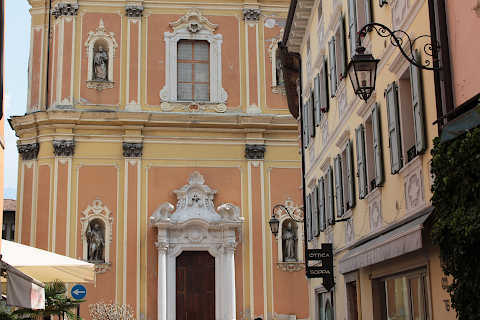 Other buildings in both the Renaissance and Baroque styles can be seen along the "Viale Roma" including the most impressive church in Riva del Garda, the Church of the Virgin, on the northern edge of the old town. Little more than one room with a dome, the interior is flooded with light and resplendent with marble columns and paintings on every surface. 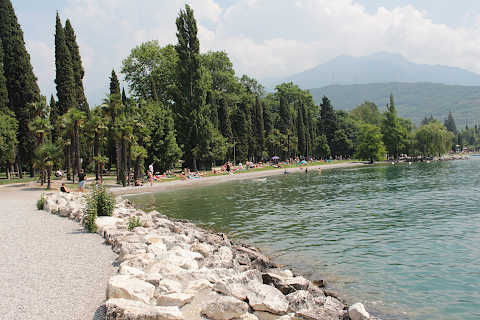 Your tour of the town can continue with a walk on the "Lungomare Brescia", an area on the edge of the lake created by restructuring some ancient structures and dating from the 19th century and the First World War. This lakefront walk also incorporates a beach area, and a park. The beach is of pebbles and very nice so it does get quite busy. The most popular excurson in the town is also the most challenging. If you look at the mountain behind the electricity generating station near the harbour, you can see the small Church of Santa Barbera high on the hillside.The church was built in the 1930s by the workers who were installing the pipes for the electricity station ad wanted to have a place to pray. To reach the church is about a three hour walk, and as you can tell when you look at it there is a lot of walking uphill involved! You will need sturdy shoes and plenty of water, but the views when you get there are amazing! If that is a bit too challenging, there is a different walk that leads to an ancient fortress called the Bastion which is much easier but also has very nice views. 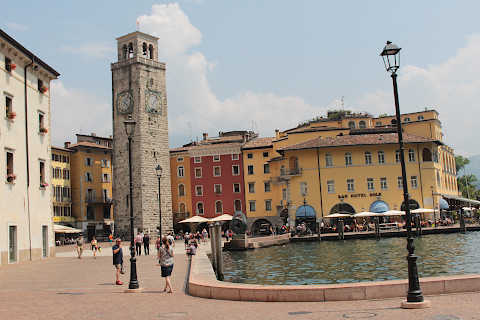 In Roman times the town was a centre of great importance due to its location on the shores of Lake Garda and because of the closeness of the Sarca River. In the middle ages Riva del Garda was a fiefdom of the Bishop of Trento, but control of the city was often contested by other Italians such as the Venetians, the Scaligeri from Verona and the Visconti from Milan, as well as by foreign powers including the Tyrolese, Austrian, Germans and French. Despite these many challenges the city always retained a certain autonomy. 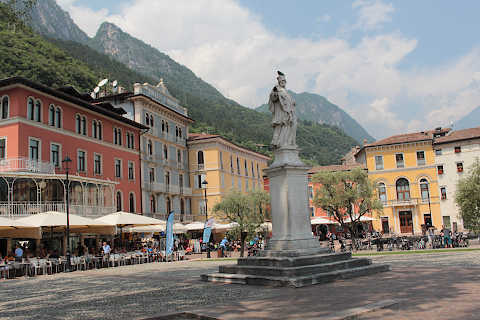 Having started the 20th century as part of the Austrian Hapsburg Empire, Riva del Garda became part of Italy after World War 1 and part of Germany during World War 2. 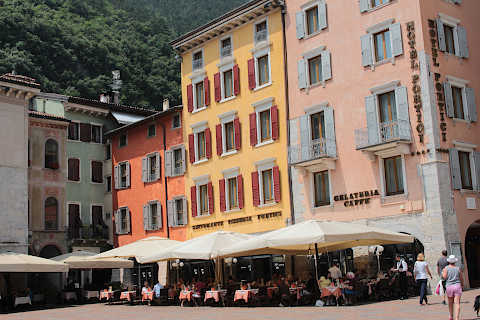 It is now firmly established in Italy, although the Austrian-German heritage can be seen in the architecture of the town. 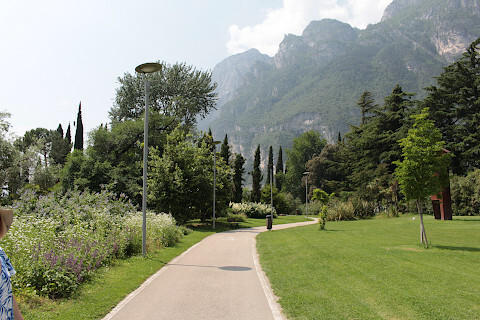 A short walk from Riva del Garda takes you to the Varone Waterfall, about 100 metres high and well worth the walk. 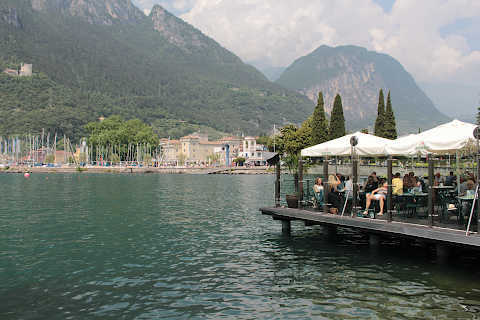 Other particular local highlights include Lake Tenno and Lake di Ledro, both of which are in scenic positions surrounded by mountains. 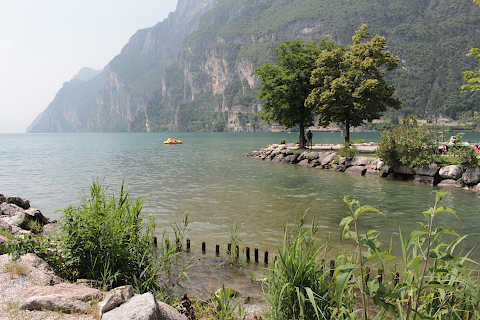 You might not guess given the location of Riva del Garda but it also has a very popular windsurfing centre based at nearby Torbole, with a reliable wind from the mountains blowing out across the lake. 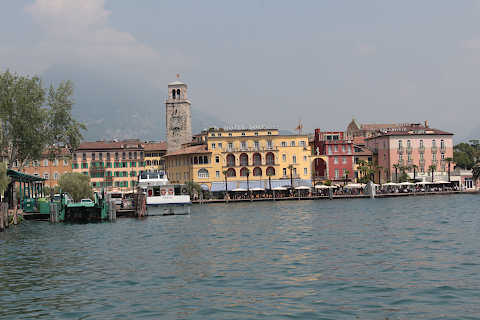 The other resorts around the shores of Lake Garda can also be reached using the ferries that regularly cross the lake, although from here it is a long boat journey to reach those at the southern end of the lake such as Sirmione so Riva del Garda is best used as place to stay when visiting the north of the lake, but not the south. Heading north from here and away from the lake you reach Arco and Canale, picturesque villages and a good place to start more adventurous excursions into the dolomites. Further north you reach the mountains and winter ski resorts such as Madonna di Campiglio. You can find more local travel ideas in the Trentino-Alto Adige guide.